I just finished a run with the Nike + Running App on the Apple Watch. I have been spoiled and have used the Nike + Running app on my phone for years. I really like the GPS and the maps that they create. I like being able to look back over my run and see where I was on the run when I was fast or slow. When I use the Nike + Running App on my Apple Watch, The first screen has a start button. I can scroll down using the digital crown to change my playlist or turn music off completely. I like that it defaults to the last playlist and run I picked on my iPhone. It pulled my music and running settings (indoor or outdoor) and I could just start the run without any setup. I listen to the same playlist generally and usually only update to a new playlist on certain races so this is great for me. It recorded my distance and used the GPS from my phone just like I am used to. The one thing surprising about it is my Apple Health App didn’t record any heart rates during my run. I am kind of disappointed that it didn’t record this. 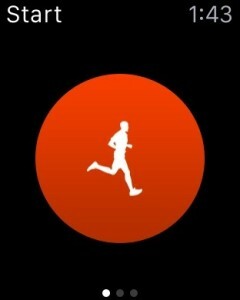 I will keep playing with both the Workout App and the Nike + Run app to see what will work best. It is kind of nice that the workout app records your data in the “Activity” App on the iPhone. You can go back in the Activity App and view your Workout App activity and it gives total time, distance, pace and heart rate. I wish that Nike pulled the heart rate too. Maybe they will do an update to the app to write that information. I checked my Apple Health App, and currently, I can only give Nike + Running the ability to read my heart rate information. The Nike + Running app seems to be a little slow on the Apple Watch. It doesn’t always display the correct song, nor does it always show my recent activity. These aren’t big drawbacks to me as I don’t really care about these features for my watch. I really liked the ability to skip a song on my playlist right in the app so all in all, I am happy with the App.